Apigee hybrid collects operations metrics that you can use to monitor the health of hybrid services, to set up alerts, and so on. 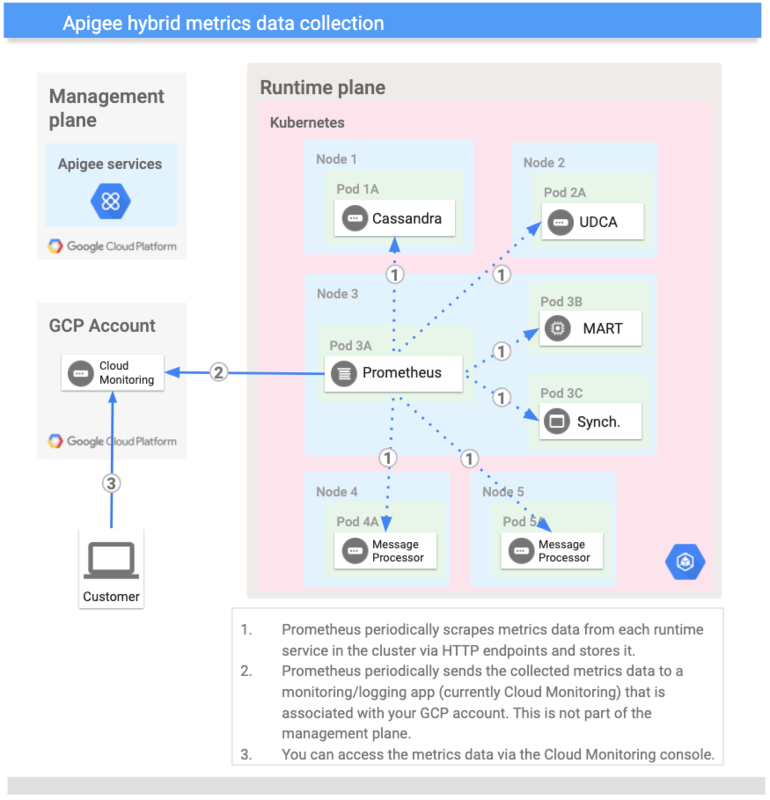 Apigee uses the industry-standard Prometheus add-on for metrics collection. Once collected, Hybrid sends the metrics data to Stackdriver, at which point you can use the Stackdriver console for viewing, searching, and analyzing metrics and managing alerts. As you can see in this diagram, there is one Prometheus server running per cluster, and it can run on any pod in the cluster. Prometheus scrapes application metrics data from all Hybrid services and sends the metrics data to Stackdriver. You can access metrics data through the Stackdriver console. Metrics collection is enabled by default. To disable it, see Disable metrics collection. To send metrics to the Stackdriver application for your GCP account, you must set configuration properties in the overrides.yaml file. Do this configuration whether you are on a GKE or a non-GKE cluster. 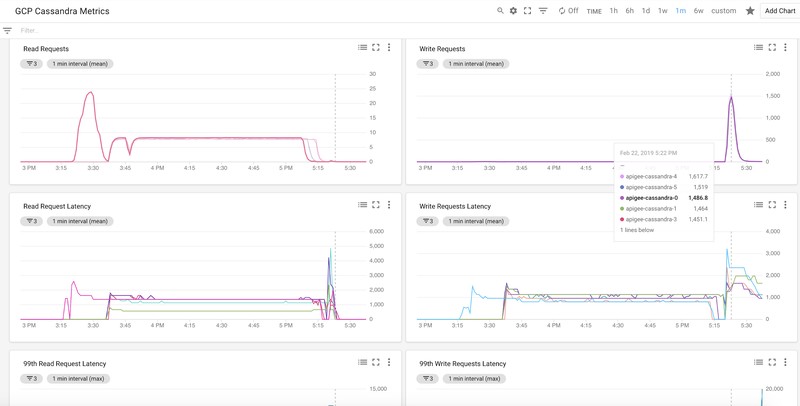 Create a GCP service account with the Monitoring Metrics Writer role. You can create the service account using the hybrid CLI command create-service-account:. For more information about GCP service accounts, see Creating and managing service accounts. The create-service-account command saves a key on your system as a .json file. Note the path to the file. You will need the path in the following steps. sa_json_file_path is the path on your filesystem to the service account JSON file the create-service-account command saved. GCP_project_ID is your GCP project ID for the project where you want the metrics to be sent to. cluster_name is the name of the cluster running hybrid. NOTE: The value of cluster_region must be in the standard GCP region format and you must specify the closest GCP region to where your cluster is located. For example, if your cluster is located on premises in Seattle, Washington, USA, the closest GCP region is in The Dalles, Oregon, USA, with the name us-west2. In this case, you would set k8s_cluster_location to us-west2. Apply the configuration to your cluster. You can use Stackdriver to view your metrics information. You do this by selecting a resource type and a metric that has data from that resource type. Open the Stackdriver Metrics Explorer in a browser. Alternatively, if you're already in the Stackdriver console, select Resources > Metrics Explorer. In Find resource type and metric, begin typing "proxy" in the search box. Select GET from the menu. Stackdriver displays data for the selected metric. To save the selected metrics settings, click the Save Chart button. In the GCP console, be sure your project is selected. Go to the GKE Kubernetes clusters screen. Select the Nodes tab. This tab shows you a list of all of the nodes in your cluster. Select one of the nodes from the list. Click the VM instance link. Locate the Service account and make a note of the ID (it looks like an email address). Go to IAM & Permissions in the GCP console. Locate the service account ID in the list. The service account roles are listed there. For more information, see Granting roles to service accounts.